Lowdown: A warning about the perils of social networks and the companies running them. The Circle is one of those movies that tries to send its message across by attaching a human face we can identify with to along for the ride. 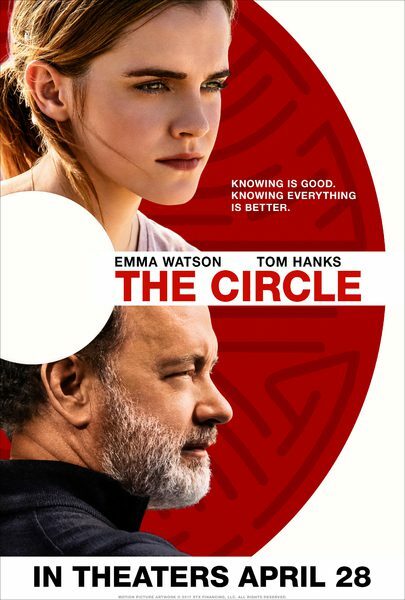 In this case, our story is told through a young woman, Mae (Emma Watson), who escapes her awful temp job for a lucrative position at a technology/social media company, The Circle. The Circle is a cross between Google and Facebook with an HQ not unlike Apple’s newly erected one and a boss (Tom Hanks) not unlike Mark Zuckerberg mixed with Steve Jobs. We get our first glimpse into the power of The Circle at the beginning through its new invention, a tiny disposable camera people can stick anywhere to record and send back to The Circle everything it sees. There the video and sensor array's data are all analysed to minute detail, and without anyone noticing everything passing in front of the camera is digested and broadcasted to the world. Not unlike the cumulative effect of all the phone cameras surrounding you & I at any point in time. As Mae gets further into the thick of her new job, her personal health data joins the public sharing ride; then her location, which puts her under pressure because she didn’t come to work on the weekend and instead spent time away from fellow Circle workers. Mae is pressed to choose between her private life, the former boyfriend she is still using, her kayaking hobby, and her ill father (Bill Paxton, R.I.P. ), as all the while we keep learning more and more about The Circle’s invasive nature and how it affects Mae’s life. Eventually, Hanks’ character exposes the grand Circle plan: people running our democracies straight through the social network, without needing politicians to represent them and this whole thing philosophers refer to as "the will of the governed". Think about it, this idea is the natural extension of where the likes of Facebook have been taking us in real life; it’s probably the reason Mark Zuckerberg spends his time visiting “ordinary” American families for dinner. Governments, says Hanks’ character, need us more than we need them. Let us have the full will of the people available all the time! As you can probably tell by now, The Circle aims to deliver its message on the dangers of these new companies on the cutting edge of guiding us on how we should live our lives. The film does so by pointing at the extremes of what is already happening, which is why it borders on brilliance. Ultimately, the movie points at the hypocrisy of the people issuing us with these messages about the need to share our lives and the very private lives they themselves live, whether their last name is Zuckerberg or Schmidt. I will openly admit this subject matter is very close to my heart, and as per Russia’s involvement in the USA elections it’s also been on the news a lot lately. That said, The Circle’s handling of this subject matter feels rather heavy handed in its story development and, as a direct result, rather superficial in its exploration of the consequences. One can argue it is hard to cram it all into a movie and still have a crowd favourite in hand, but I will argue Black Mirror and even The Orville have already done that and and the result was way better. Then again, perhaps the real message The Circle sends across is that of a world in which the TV series has toppled the movie theatre. Overall: As interesting and important as its point is (and I can only assume that has been the reason someone like Tom Hanks would engage himself in such a movie), The Circle misses the nail with its jackhammer. 3 out of 5 crabs.